HTC and Verizon Wireless today announced the Droid DNA, a new flagship Android phone with the first full 1080p HD display in a phone for the US. The 5-inch display has 440 ppi pixel density. The phone sports a curved glass front and a unibody solid polycarbonate curved back with matte texture. Features of the DNA include the same 8-megapixel camera as the One X, plus HTC's ImageChip, supporting simultaneous photo and video capture. The 2.1-megapixel front camera has a wide-angle f/2.0 lens. The processor is a quad-core Qualcomm Snapdragon S4 Pro at 1,500 Mhz. It comes with 16 GB of fixed memory and a 2,020 mAh non-removable battery. Audio is powered by Beats, with dual amplifiers at 2.55-volts. The phone also includes wireless charging. The Droid DNA is available for pre-order today, shipping November 21 for $200 with contract. If the "phablet" category of super-phones blurs the line between phone and tablet, HTC is now blurring the lines even more with the Droid DNA for Verizon. With a 5-inch screen, the Droid DNA is notably larger than high-end phones with 4.7-inch screens. HTC's new superphone is the first to ship in the U.S. with a 1080p HD display. HTC recently indicated via its official Twitter account that it plans to update the Verizon version of the One to Android 4.3 by the end of the year and then to Android 4.4 by the end of January. All other versions of the One will receive Android 4.4 by the end of January, too. Which in my eyes is the only thing wrong wit the device, other than it being on Verizon and not Sprint, which is notorious for carrying HTC products more than Verizon. Ask Verizon. 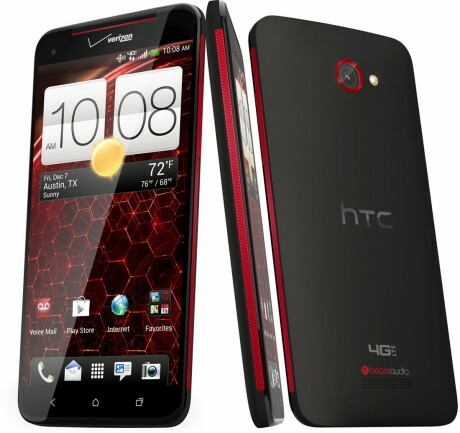 HTC would gladly make a 64GB version of this with a memory card slot (trust me) but that's not what Verizon wanted. Makes no sense that the Butterfly J does though. HTC has been making a lot of stupid decisions lately, that isolate potential customers, that sway people towards the Galaxy S3, like the non-user accessible batteries & non expandable memory! There's one amp for the speaker and one for the headphone jack. They're high-power amps. Many phones have just one low-power amp. Hey, thank God for the Galaxy S3, I was nervous Samsung would follow this trend before the S3 was officially announced, but was greatly relieved that both the battery AND memory are expandable! The battery is in the middle of the device, between the display and the circuit board. That helps them make the back curved and the device volume smaller overall. So it can't be removable, but at least there's a genuine trade-off there. A blu-ray video file that retains 1080P is going to run you at least 15GB..Avengers was 16GB for the MKV rip online.